Phones brought in by patients must be kept clean, just like any equipment used at a hospital. 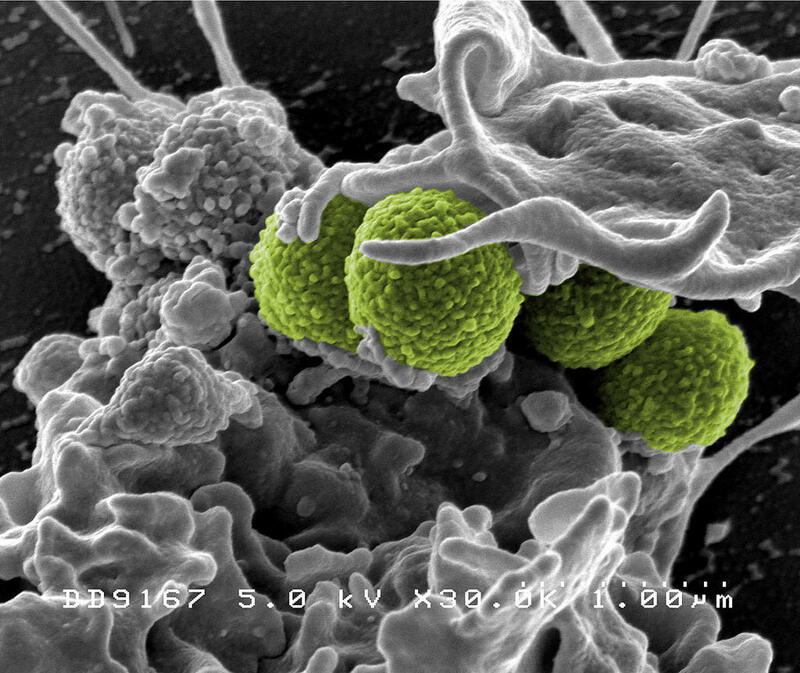 The MRSA252 strain (green bacteria) is a leading cause of hospital-associated infections in the U.S. and the UK. Staff have to keep their stethoscopes clean so patients don't pick up infections. The same goes for phones. Sometimes people go to a hospital, and they leave with an infection. A new device being tested at St. Francis Hospital might reduce those infections. The U.S. Department of Health and Human Services estimates that at any given time, around one in 20 patients leaves a hospital with an infection. The U.S. Centers for Disease Control and Prevention called this a "major, yet often preventable, threat to patient safety." Part of the solution to hospital infections is simply to keep hospitals clean. St. Francis Hospital in Hartford is testing a device to disinfect phones and tablets in one of their "step-down units," where patients go after being intensive care. Here, the staff have to keep their stethoscopes clean so patients don't pick up infections. The same goes for phones. In 2010, researchers defined patients' bed rails and bed tables as high-touch surfaces. A doctor has to touch them at least three times when seeing a patient. Inventor David Engelhardt said phones should be included in that group. "Think about a mobile device, a handheld, a tablet: you have to, by definition, use it with your fingers," he said. Not keeping your phone clean could be a problem: Back in 2011, researchers in Turkey found that among the people who visit hospitals, 40 percent had pathogens on their phones; the same was true for around 20 percent of the people working in the hospitals. The samples included strains of multidrug resistant bacteria. The findings of the small study were published in the American Journal of Infection Control. So St. Francis is trying out a device Engelhardt invented: ReadyDock, about the size of a printer, with trays for phones and tablets. Once you slide the tray with your phone into the machine, you press a button, and the machine bathes it in UV light for 60 seconds to disinfect it. St. Francis Hospital has been using ReadyDock to disinfect phones and stethoscopes since December. "The real acid test is: does it make a difference for the patient?" St. Francis organized a demonstration event recently, and almost all the hospital staff and visitors who got their phones disinfected that day admitted they had never even considered it. Engelhardt said he ran a trial with the microbiology lab at the Yale New Haven hospital to demonstrate that ReadyDock disinfects more than 99 percent of the bacteria spread on a device. Most of the hospital visitors who stopped by a booth to get their phones disinfected admitted they had never even considered the cleanliness of their devices. That might not be enough, according to Paul Skolnik, an infectious diseases specialist at the University of Connecticut. He said, "The real acid test is: does it make a difference for the patient?" Skolnik said that rising health care costs mean hospitals should make sure using the device can really reduce the number of infections to patients before installing it widely. He also said the key to reducing infections isn't always about better technology. For example, recently released data from 2012 shows that when compared to national figures, Connecticut hospitals have a lot more infections spread through urinary catheters. Skolnik says doctors know the right procedures for inserting the catheters so they don't get infected, but it's hard to change human behavior. "The science of infection prevention has come a long way," Skolnik said. "We know for most infectious agents, how these agents are transmitted and we know how to prevent that transmission, the challenge often is more in the social and behavioral sciences than it is in the medical sciences, because you have to have people be able to comply routinely with infection prevention, risk reduction methods." Skolnik said sometimes that's as simple as making sure people wash their hands. St. Francis has been testing ReadyDock in the step-down unit since December. The hospital also plans to collect data on how effective it is, with a plan to use the technology in more parts of the hospital in the coming months.